Important: The information contained below is for guidance only. Although every effort is made to ensure its accuracy, we strongly recommend you visit the UKVI website for up-to-date information. Short-term Study (6 months) – for students aged 16 years or above (course duration - 6 months or less). This is formerly known as Student Visitor Visa. Short-term Study (11 months) – for students aged 16 years or above (only for pure English Language courses that last up to 11 months in length). This is formerly known as Extended Student Visitor Visa. Short-term Study (Child) – for students aged under 16 years old (course duration - 6 months or less). This is formerly known as Child Visitor Visa route for short-term studies. 1. Short-term Study: 16 years old or above, courses of maximum of 6 months. Students enjoy freedom in that, they do not have to study full time and there is no requirement for the course to lead to an approved qualification. they will not be allowed to do any work or work placement (even if it is part of a course, or is unpaid) – Please note that since August 2015, Tier 4 General students would only have work rights if they are sponsored by HEIs. To be considered for a Short-Term Study visa, students must show that they have been unconditionally accepted on a course that is provided by an organisation that is the holder of a Tier 4 Sponsor Licence or accredited by a UKVI recognised accreditation body. Students must have the financial resources to accommodate and maintain themselves during their studies in the UK. Please see the document named Short-term Study Visa Info Sheet for full details and tips. 2. 11 months Short-term Study visa: 16 years old or above, English language courses of up to 11 months. Since 10 January 2011 this visa type (formerly known as Extended Student Visitor Visa) allows students wishing to study pure English Language courses to apply for a visa to stay in the UK for up to 11 months. 3. Short-Term Study (child): 15 years old and under, courses of maximum of 6 months. Students are more restricted than their Tier 4 Child Student counterparts as they will not be able to extend their stay in the UK, i.e. they must return home and re-apply if they wish to come back to the UK for more studies. In addition to the documents required for a Short-term Study visa for students who are 16 or above, students under the age of 18 will need to have made arrangement for their travel and stay in the UK and have permission from their parents or legal guardian to study in the UK. When should you use the Short-term Study route? do not have a SELT or their SELT grades are below relevant Tier 4 requirements. (see Tier 4 route section below for more information) and there will be enough of a gap between their studies to allow them to return home and re-apply for a new Tier 4 visa to continue their studies in the UK. You can only apply for a visa up to 3 months before your intended course starts in the UK. Full details on applying under each visitor route can be found here. To find out if you need a visa to study in the UK, visit this webpage. 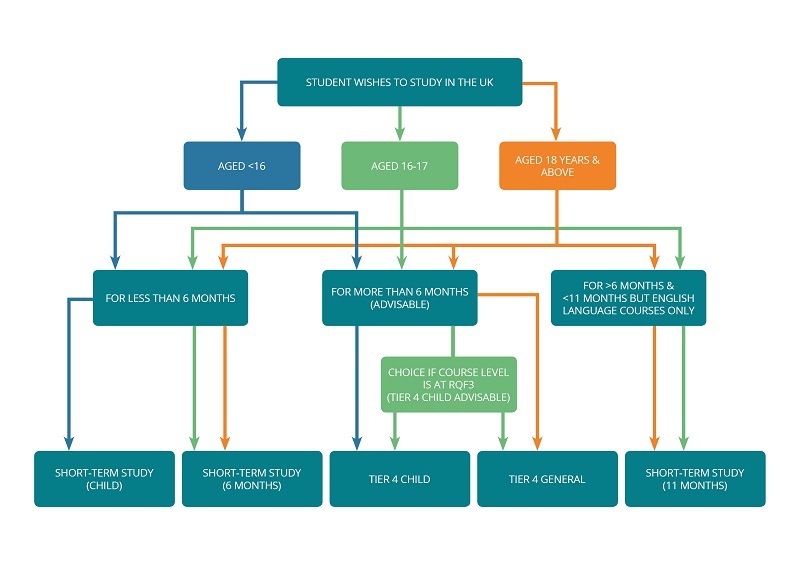 This is the route for those intending to study in the UK for more than six months. Please note that all students applying for Tier 4 (for over 6 months) from summer 2015 are issued entry clearance (yellow sticker) for one month only. Students will need to collect a Biometric Residence Permit (BRP) card within 10 days of arriving in the UK. The BRP card would cover the full length of their student visa. Your institution will give you more details on how to collect the card and you will also receive a letter from UK Visas and Immigration with more information following a successful visa application. A student cannot make a visa application more than three months before the start date of their course. Tier 4 General Student: Also known as Adult Student for those aged 16 years or above. Maximum length of stay under the Tier 4 General route is 2 years for courses below degree level (from student’s 18th birthday) and 5 years for courses at or above degree level, subject to certain concessions. Please refer to the UKVI website for details. Students aged 16 or 17 years old can apply either as a ‘Tier 4 General Student' or a ‘Tier 4 Child Student' if they are studying a course at Regulated Qualifications Framework (RQF), or National Qualifications Framework (NQF) / Qualification and Credit Framework (QCF) Level 3 or above. As of August 2015 – students wishing to join Foundation courses will have to apply under Tier 4 General route and therefore must have a UKVI-recognised SELT. We generally recommend that 16 or 17 year olds enrolling at our CATS colleges apply under a Tier 4 Child Student visa, with the exception of Foundation courses. 16 or 17 year olds studying a course at RQF/QCF/NQF level 2 must apply under Tier 4 Child route only. What is the Visa Interview (Credibility Test)? Tier 4 applicants aged 16 or above can be asked to attend an interview during their visa application process. The purpose of visa interview is to check applicant’s credibility as a genuine student and interview questions can include applicant’s reasons for choosing to study their programme in the UK, their knowledge of the chosen programme and whether they can afford their studies in the UK. These interviews can be carried out via video link with the Home Office interviewing team in the UK, face-to-face with Entry Clearance Officers based in UK Embassies/High Commissions or via telephone. Video-linked interviews: When students submit their applications in their home country at a Visa Application Centre (VAC), they could be asked to attend an interview with the Interviewing Officers, who are based in the UK, via the video-link facility. Interviewing Officers will be asking a series of questions around student’s intention to study their course with the institution in the UK. Face-to-face interview with an Entry Clearance Officer at the local embassy or consulate for which students would normally be invited to attend an appointment in advance. The questions will be around intention, but can also be around their financial background, previous education/work history and other immigration-related questions. Telephone interviews can also be conducted at times with a Visa Officer so students must make sure their telephone contact details are up to date and be prepared that there is a chance they might be called upon by the Visa Office. Will students always be interviewed when they apply for a visa? Yes, for Tier 4 General applicants applying from the countries where the Credibility Test has been rolled out and this will happen when they submit their visa applications at their local VACs. It is worth to note that UKVI defined ‘low risk’ countries are exempt from the Visa Interview requirement. How do I prepare for the Visa Interview? We do recommend our students to prepare for these visa interviews so they can answer the questions properly and accurately to assist the Visa Officers who will be assessing their applications and this also ensures there is minimum delay to the processing of their visa application. Do attend - Failure to attend the interview may result in your application being automatically refused. In the event you cannot attend, contact the Visa Office to reschedule. Do answer - You should always answer all questions fully and honestly. Do think - You should think in advance about your course, the documents you provided for your visa application, and your intention to study. The UKVI (UK Visas and Immigration) want to know that you have given serious thought before choosing your course and researched the options. Do speak in English! - One of the most important things they will be checking is your level of English, so always answer in English, not via an interpreter. Do ask - Ask for clarification if you do not understand a question to make sure you are providing the information they want. What is the name of the school? This may not be the same as the school's Tier 4 name – check your CAS statement for these details. Did you use an educational agent at any stage (even if you stopped using them)? Who is/was your agent and why did you choose them? Why did you choose this university/college/school? Why did you choose this course and how does it relate to your previous study? Why do you wish to study in the UK? Why not stay in your own country to study, if similar courses are available there? What is your plan after completing the course? Do you intend to stay in the UK (for additional studies) or are you returning home? If you are changing course or study pathway, why are you are making such a change of direction in your studies? How do you explain any gaps in your previous education/employment history? What is the course name and academic level? What qualification will you get after the course if you pass? This is all on your CAS and/or offer letter. When does the course start and finish? How many terms/semesters is it? What are the modules/subjects of the course? What will you study during the course? How are you going to be assessed on the course? Did you do any research before choosing the school/course? What other schools/courses did you consider, and why did you decide on this one? How is this course going to benefit you for your future career and/or academic plans? Who is going to pay your tuition fees and living costs? Where did they get the money? What is their salary? You might need to provide documents to prove your financial ability to study in the UK, such as additional bank statements and proof of income from your financial sponsors. Do you have all of these? Make sure you bring additional documentations required by the Visa Office. Do you know how much it costs to live in the UK and also what you might spend on day- to- day items such as food, travel and accommodation? Do you know the total cost of the course and have an idea on any future courses? Where is the school? Which city is it in and which part of the UK does it belong to? Have you arranged accommodation? If not, why not? How will you/did you find it? How much does accommodation cost in the city/town where you will be studying? How will you commute between your accommodation and the school (bus, train, underground etc.)? Students applying for Tier 4 General must complete and pass a Secure English Language Test (SELT). The current list of approved tests can be found here. All students requiring a SELT will need to take an IELTS for UKVI test at an approved SELT centre. The list of approved centres can also be found in the link above. Please note that students progressing from a Tier 4 Child visa to a Tier 4 General visa are exempt from the SELT requirement if they have successfully completed a course in the UK as a Tier 4 (Child) student or as a student under rules in force before 31 March 2009, where they were under 18 when granted leave, provided the course was at least six months long and it was completed no more than two years before the CAS was assigned. Students over 18 with English level below B1/IELTS 4.0 will have to use the Short-term Study visa route. Only CATS students may use the Tier 4 Child visa route as long as they intend to join Pre: Programme, IB Diploma or A Level courses. ONCAMPUS students will be close to university age, hence following the university visa route, i.e. Tier 4 General visa route. Further details about the Tier 4 General student visa can be found here. Further details about the Tier 4 Child student visa can be found here. Tier 4 General applicants who are 1) sponsored by a Higher Education Institute (HEI) for 2) courses at or above RQF/QCF/NQF Level 6. Students who have successfully completed a course in the UK as a Tier 4 (Child) student or as a student under rules in force before 31 March 2009, where they were under 18 when granted leave, provided the course was at least six months long and it was completed no more than two years before the CAS was assigned. Students who have completed an academic qualification equivalent to a UK degree which was taught in a majority English-speaking country (with the exception of Canada), including UK. Presentation of a Certificate of Acceptance for Studies (CAS) from a licensed Tier 4 sponsor. Course fees for up to 9 months. Monthly living costs for up to 9 months. See table below for specific amounts depending on length of course. A bank statement must be provided to confirm the student (or parent/legal guardian) has held the money for a minimum of 28 days. Total points required to be granted a visa. The Confirmation of Acceptance for Studies (CAS) will include information about the student, their sponsor (educational provider), their course, the evidence used to obtain the offer and the fees. Cambridge Education Group's admissions team will send out CAS statements to those who need to apply under the Tier 4 route. This is conditional upon the student fulfilling the terms set out in their offer letter and having confirmed their place(s) by returning the required deposit or sponsorship letter. The CAS statement should then be included with their visa application. The student's name, date of birth, nationality, country of birth and passport/travel document number. Course details such as name, level, start and end date, hours per week, address of student's main place of study. Documents used to obtain the offer: this will give a brief description of our assessment of the student's academic level and English proficiency, including details such as student's previous courses/qualifications and Secure English Language Test results. If a student has previously studied in the UK under Tier 4 route, an Academic Progression statement on how the new course of studies represents academic progression is also included here. Course fees for the first year and any payments already made. If relevant, any accommodation fees for the first year and any payments towards it already made. Most student visa refusals under Tier 4 are due to errors in financial documentations. Please read this section carefully and use the link provided for up to date advice. For more information on Tier 4 General maintenance requirements. For relevant information regarding funds requirement relating to your course at CEG, pleae refer to the documents on the top right hand side of this page under the name of 'Evidence of your Finances'. The financial evidence required will depend on whether you are boarding at the school or living independently. Please refer to the UKVI website for full details. If it is through a financial sponsor, this means a student is given money to cover their course fees and living costs. If their financial sponsor is only covering some of the student's course fees or living costs, then he/she must show evidence that they have the rest of the money needed (as above). The student must provide a letter of confirmation from their official financial sponsor, which may be Her Majesty's government, the student's home government, the British Council or any international organisation, company or university. It should not be a relative (except parents) or non-international company. amount of money that the official financial sponsor is giving to the student or a statement that they will cover all (or part) of the student's fees and living costs. Fees already paid to institutions towards student's tuition fees can be deducted when calculating how much money a student needs to meet the maintenance funds requirements for a Tier 4 visa application. However as per the rules came into force since 6th April 2012, please note for fees paid towards accommodation fees, there is a maximum of £1,000 can be offset against the required funds for Tier 4 General students and Tier 4 Child students who live independently. If in any doubt, please contact our admissions team for advice before making a payment towards the balance of your fees. A letter from parent/legal guardian confirming the relationship between the applicant and the parent/legal guardian and that parent/legal guardian consent to using their funds to pay for the tuition and maintenance during the applicant's studies in the UK. Download and read our quick reference guide to evidencing your finances to ensure you satisfy the UKVI requirements. All Cambridge Education Group Colleges and Centres have Tier 4 sponsor status. The Tier 4 sponsor licence register can be found here. ONCAMPUS London: Birkbeck, University of London, Malet Street, Bloomsbury, London, WC1E 7HX. Note: International students can only study with a licensed sponsor. As a condition of being a licensed sponsor, the education provider is responsible for the student while they are in the UK. All Cambridge Education Group colleges and centres will liaise with the UKVI and are obliged to report students to the UKVI if they 1) do not arrive for the start of their course 2) withdraw from their course 3) defer or suspend their studies 4) are absent for significant periods of time. Type of the Tier 4 sponsor. Please refer to the Tier 4 Register of Sponsors to find out the type of the educational establishment. Only those Tier 4 General students, who are currently sponsored by a HEI, Embedded College or Independent School, could extend their visa in the UK. Gap between the current visa end date and new course start date MUST NOT exceed 28 days. Academic Progression requirement must be met. According to the Home Office clarification – Academic Progression requirement is met when an applicant successfully completed (meaning you have achieved the qualification for which you were studying) the previous course for which you were last granted Tier 4 leave, and your new course must be above the level of the previous course for which you were given Tier 4 leave. 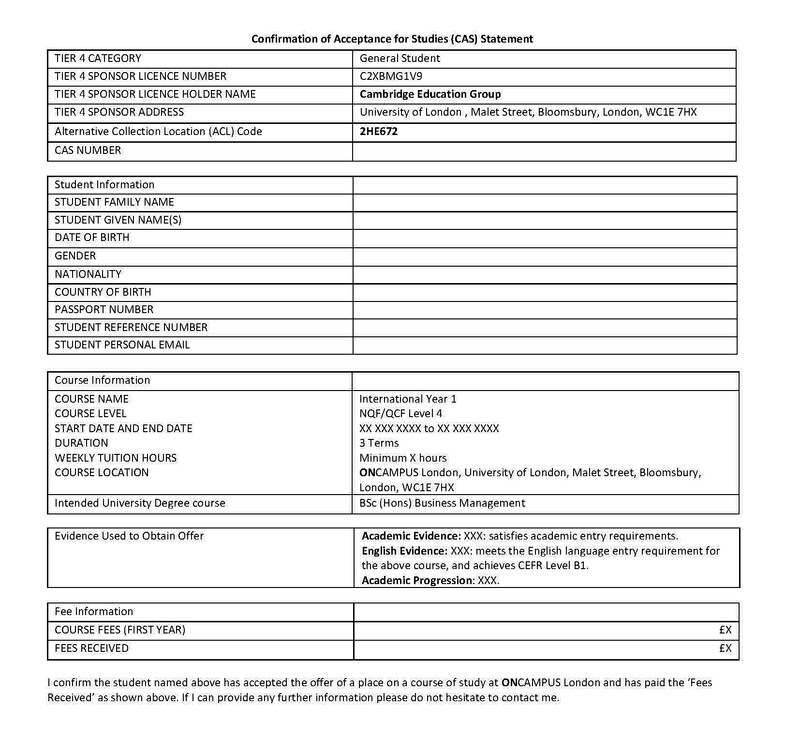 Documents listed by their sponsors in the CAS statement assigned by their Tier 4 sponsor, such as academic transcripts and IELTS certificate. Read more about visa interviews. Working whilst studying brings many benefits including extra money and it can also help to improve the level of the English language. However, the students should be careful not to let their job interfere with their studies as this is, after all, the reason why they are here in the UK. Do not under-estimate the hours needed to focus on studies in order to successfully achieve the desired academic result. Tier 4 Child students, who are over the age of 16, are allowed to work if it is no more than 10 hours a week during term-time; full-time during vacations. Tier 4 General Students - only if their sponsor is HEI – are allowed to work between 10—20 hours during term-time (dependant on the level of the course), and full time during vacations. Note: Please always refer to the UKVI website for up to date information in case of policy changes. Dependants of both of these categories of students are able to work.